Not even the Summer heat could slow down the Mach1 Motorsport team last weekend. 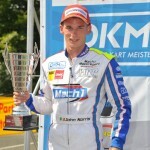 At the fourth event of the German Kart Championship, the chassis manufacturer fought for places on the podium in the DKM and is now aiming for the vice-championship with John Norris. Temperatures of 35°C and up made for hot circumstances on the 1.375m track in the Hunsrück. 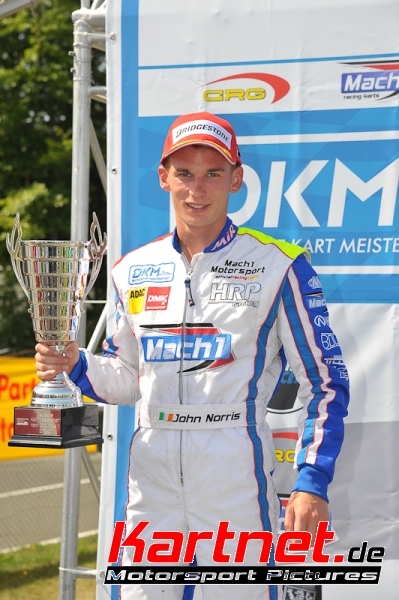 From the beginning, Irish factory driver John Norris was among the top drivers in the DKM and was able to start into the first race from fourth position, after coming in 4th twice during the Heats. Norris started perfectly and gained the lead after only a couple of meters. He wasn’t able to bear up against the pressure of his opponents though and temporarily fell back to fourth place. Norris kept cool nonetheless and fought his way back to second position. “What a race”, rejoiced team leader Martin Hetschel after the race. Lucas Speck rounded off the success. Achieving eighth rank, he was the most successful German driver in the DKM field. During the second race, the inferior outer track caused Norris to lose important positions, but he managed to fight his way forward again during the 18 laps and was able to seize 4th position on the home stretch. In the overall list of rankings he is currently on third place and still even has the chance to achieve vice-championship at the season finale in Genk. Team mate Speck had some bad luck this time: after a skirmish at the start he only came in 23rd. At the juniors, Cedric Piro experienced a weekend of ups and downs. After coming in 10th at qualifying and even 6th during the Heats, he had to park his kart in the off before the second race had even started. He was thus only 33rd all in all and had to try qualifying for the finals in the repechage. Possessing the necessary professionalism, he did not risk too much during the race and managed to reach the finals by coming in 3rd. From the back of the field he proved his talent for driving. Due to skillful maneuvers he passed by his opponents and finished 17th and 10th respectively. Thereby he collected valuable championship points and still has the chance to place in the top ten in the overall list of rankings. Johan Nicolai Hagenaes broke new ground by starting in the DJKM for the first time, but unfortunately had to bow out after the repechage. The team will travel to the next race in France next weekend already. The second event of the U18 world championship will take place in Angerville. Previous PostMach1 Motorsport experiences a mixed European Championship finalNext PostThe new Mach1 DD2 chassis now available!